Spacious premium studios are configured to give you space to enjoy the room, executive desk and data facilities, complimentary broadband, tea, coffee and microwave facilities, excellent bathroom amenities and privacy to ensure you experience a memorable stay. The premium studios are located on both the ground and first floor. Twin beds available in some studios. Beautifully appointed and boasting all the comfort and convenience you deserve – 48” HDTVs, Sky, and, of course, our complimentary ultra fast broadband. Stay online while you’re on the road. Destiny on Fitzherbert will hold your room until 4.00pm unless notified of a later arrival time. If you do not arrive by 4.00pm, and late arrival arrangements have not been made, we reserve the right to cancel your reservation, without refund or reinstatement, to make room for other guests. 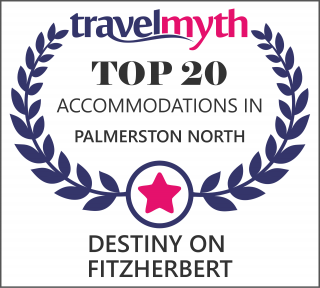 Destiny on Fitzherbert requests that all guests are checked out by 10.00am on the day of departure unless prior arrangements have been made with management. Late departures must not exceed 11.00 on the day of departure. If a later departure time is required there will be an additional charge of one (1) nights’ accommodation. Final payment is required upon departure unless prior arrangements have been made with management. Unpaid accounts will be liable for any collection costs incurred by Destiny on Fitzherbert. Penalty interest of 1% for each month that the account remains overdue will be charged. All prices quoted for accommodation cover the first two persons staying in a Premium studio and One bedroom suite. Two bedroom suites are charged on the basis of up to 4 people occupying these rooms. Additional guests staying in the rooms over & above will be charged at $20.00 per person per night. Destiny on Fitzherbert accepts the following forms of payment: Visa, Mastercard, American express and Diners Club. Payments made by EftPos or cash must be made in advance and a deposit may be requested. Destiny on Fitzherbert does not accept payment of account by cheque unless arrangements have been made with management. If payment is made in this way, should the cheque be dishonored, then any additional costs incurred in recovering the debt will be passed onto the payer directly.